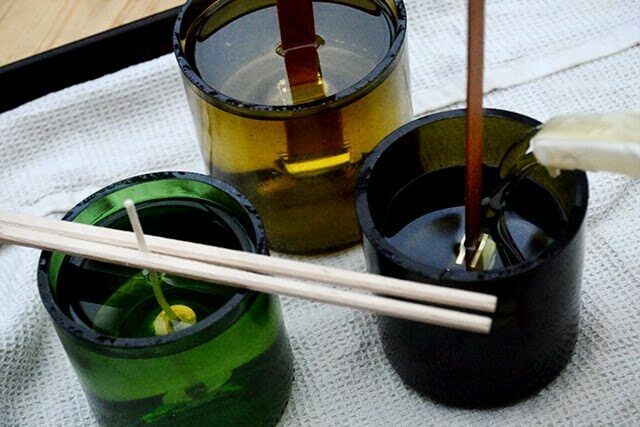 Can you believe that these handmade candles are made from wine bottles? Usually tossed out with the recycling, glass wine bottles can be used to make beautiful glasses, storage containers, votives, and candles. 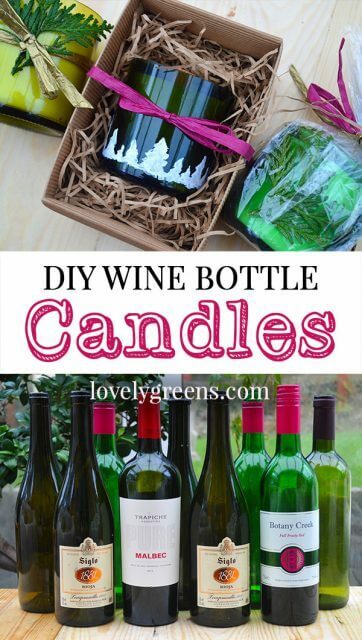 There’s a video at the end of this piece showing how I’ve made my wine bottle candles. Once made, you can gift them over the holdays or save them for birthdays or other occasions. Make sure to keep a couple for yourself though. If you use wooden wicks, like I have, then you and friends will enjoy the flickering light and crackling of a mini fireplace. 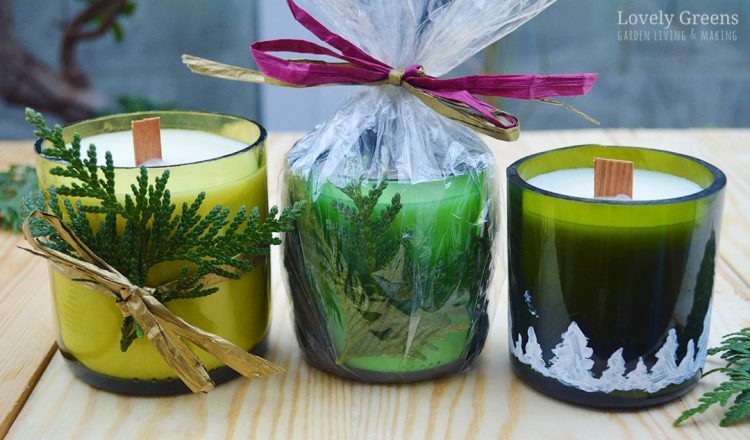 You’ll need specialty candle making materials and and about two hours to make these. You will also require a special tool for scoring the glass but fortunately it’s available through Amazon. This is the exact tool I use and it comes with easy to read instructions. If you don’t score the glass in a perfect line all around the bottle then your break line will likely come out jagged. That’s why the tool is so important. 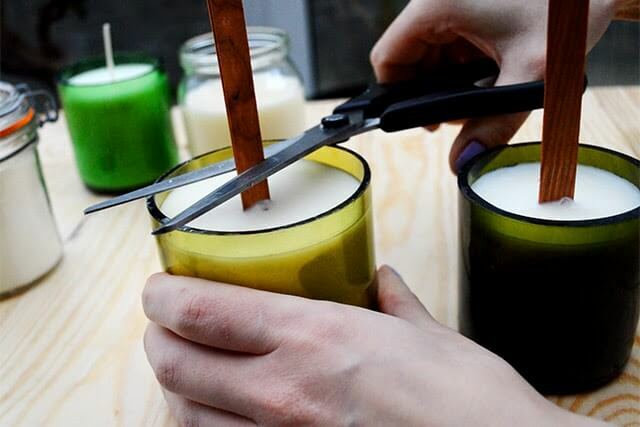 There are quite a few ingredients that you’ll need to make these candles. Some you’ll have on hand already and others will need to be purchased from a candle making supply shop. Quite a few of the items are on Amazon though and I’ve left links below to where you can get them. Optional: Essential oils – unfortunately, essential oils don’t tend to have much of a scent when used in candles. If you do want to use them, measure enough liquid in weight to match 7-8% of your total recipe weight. You’ll need a kitchen scale for this and with two lbs of soy wax aim for approximately 36 grams or 1.25 oz. The first step is putting your Diamond Tech Crafts G2 Bottle Cutter together following its enclosed instructions. It has a little bit on it that scores (cuts) glass leaving a scratch mark where the glass will eventually break. 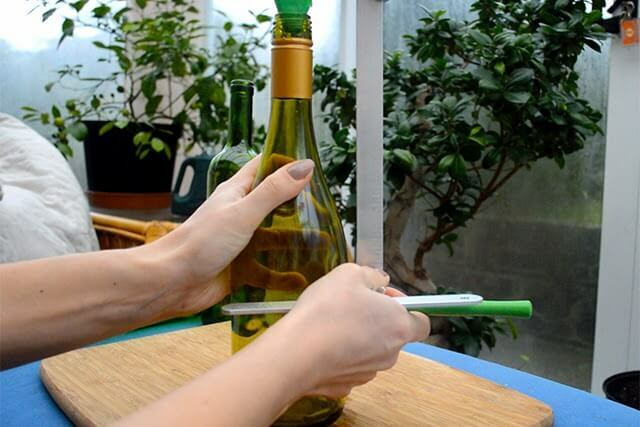 Adjust this cutting area so that it cuts about 3.5 inches from the bottom of your bottles. Now create the scores – they’ll look like the image below when you’re finished. 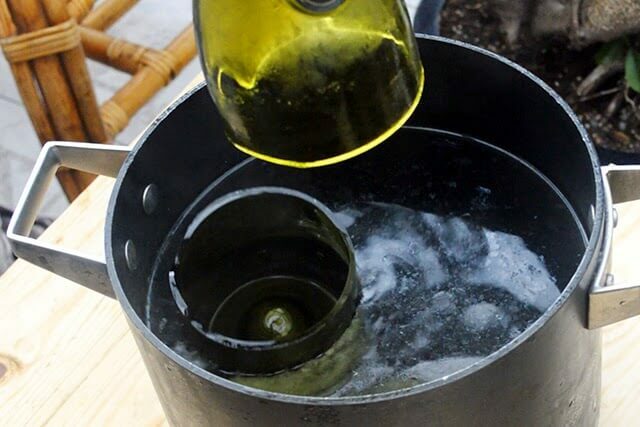 Fill one pot with near boiling water and the second pot with near freezing water. Add ice cubes to your cold water to keep it very cold. Take your first bottle and hold it in the cold water, so that the score line is submerged, for ten to twenty seconds. Then then lift it out and place it in the hot water so that the score line is submerged for another ten to twenty seconds. Keep passing the bottle between the pots until the score line cracks and the top of the bottle pops off the bottom. 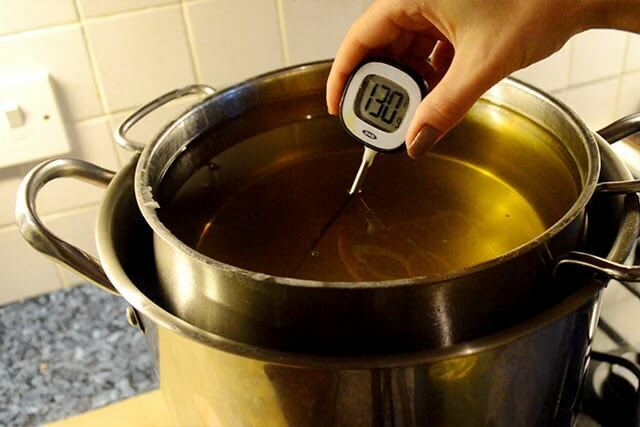 I’ve found that this works best if the water temperature in each pot is VERY cold and VERY hot. 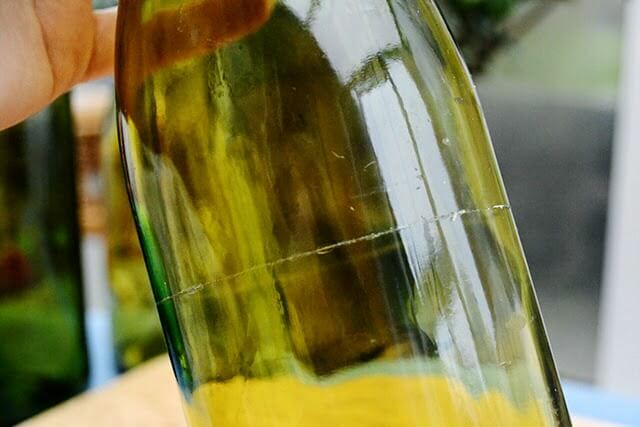 Please don’t be tempted to create another score line if you feel your bottle isn’t cooperating – usually the new score line won’t be exactly in the same spot as the original and it will cause the bottle to break unevenly. Instead, adjust the temperatures of your water. Keep a few extra bottles on hand just in case though. 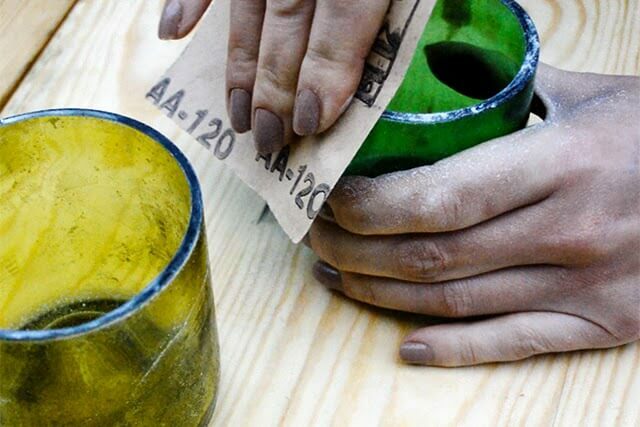 You should aim for four to five candles to fill so once you have these, allow them to dry and then use sandpaper to file the sharp edges down. It only takes a minute or so but be careful not to scratch the glass further down from the lip of the container. Heat your soy wax in a double boiler – you can use the same two pans you used in steps 2-3 providing that one of them fits inside the other. Basically, fill the bottom pan with boiling water and set the second pan (which is filled with your wax) inside it. The heat from the water below is gentler and more even than direct heat. The wax will melt quickly and once it is all liquid take the pan off the heat (out of the pan of hot water) and allow the wax to cool to between 125-135 degrees F. Other instructions will tell you higher temperatures but I’ll tell you that this is definitely hot enough for the wax to bond properly with your fragrance or essential oils. If you’ve chosen to use fragrance, stir it in for at least a couple of minutes to ensure it’s well mixed. If you’re using traditional wicks, you’ll also need to secure the top so that it doesn’t fall over when you pour the wax in. The cheapest and easiest solution is to use a pair of wooden chopsticks from your local Chinese takeaway. The way my mind works, I’d probably see this craft project as a good excuse to order in some takeaway too! ha! 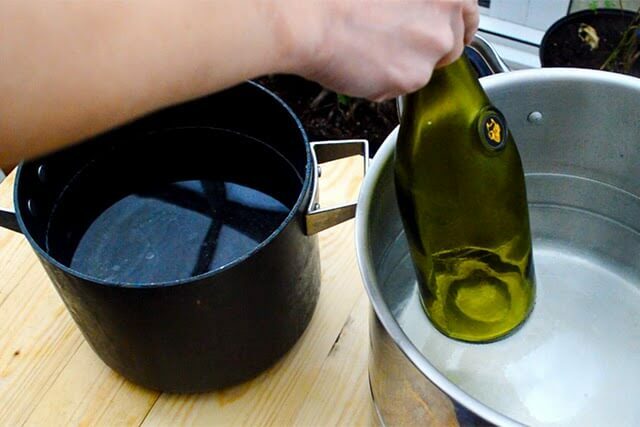 Pour the wax into the glass containers using a Pyrex jug or some sort of a plastic jug with a spout, leaving only about a centimeter (1/4 to 1/2″) space at the top. Leave the wax to harden overnight and in the meantime clean up your pot, jug, and any utensils that are covered in wax. Soy wax is easy to clean up with boiling water but try to not pour the water down your drains as it can harden and block them. An issue you might encounter with this step is called ‘Drag’ and refers to uneven adherence of the wax to the inside of the glass. It’s purely cosmetic and I’ve found it helps if you heat the glass jars to the same temperature as the wax before you pour it in. I’ve also noticed that allowing candles to harden up in a room that’s cold will also affect your chances of drag. Use a pair of scissors to trip both your traditional and wooden wicks to the same height as the lip of the container and you’re finished! Decorate it with ribbons, fresh greenery, acrylic paint, or box it up in natural kraft gift boxes and you have beautiful handmade candles that anyone would love to receive as a present. I know I would. Will give a try. Afraid cutting the bottles. Should buy some kits for it. Hello! Any tips so that the glass doesn’t split down the sides and break on other parts of the bottle besides the line? I am feeling like quite the failure. Hi Alex! The trick is making sure that the scored line does not have any breaks. That means scoring the line completely without any stops in the middle. Any place where you stop and re-start the score line will be a potential place for a crack down the side. Just spent the afternoon making these! So lovely! Your instructions are great, too. I’ll be making more. Thank you! If your are going to cut your own bottles get a kit that scores the glass. The burning twine videos on YouTube are just bottle breakers. I also recommend the water dams to contain the hot and cold water you’ll use and some HEAVY DUTY diamond sanding pads (ALWAYS WET SAND – glass dust will seriously mess up your lungs). Hi Tanya, I am interested in trying this, but all my wine bottles have i dimple in the bottom. Have you used these kind of bottles before, and can you give me any hints for leveling the bottom to get the wick in. I am also concerned with safety with these bottles. I’ve made some with the dimple in too – just fix your wick on top of the dimple. It will burn down and leave the soy wax below it though. Otherwise look for flat bottomed bottles. As for safety, what are you concerned about? Also, I would recommend a different bottle cutter called a Kinkajou. Works so great! This is fantastic – I’ve done a few so far. One question – can I re-use the soy wax if there’s some left over? i.e. not enough to fill another candle or maybe leaving it to the next day? I get clean breaks by tying twine around the bottle, soaking the twine w/ alcohol, igniting it then plunging into cold water as soon as flame dies. Sandpapers smooth easily. Wow, This is an amazing activity you just did. I can’t believe how beautifully it is done and a perfect and awesome looking candle are made. I love this share please keep posting. Thanks Jessica 🙂 I really appreciate your feedback! Do you think you’ll make some of your own? Well, I have to say, after reading your blog a few weeks ago, I went ahead and bought the g2 cutter….it works! You can see what I have done….since I read your blog….at wildoakdesigns.blogspot.com…. The one thing I recommend…use more sandpaper than the G2 kit gives….I bought a bottle cutter finishing kit of sandpaper from Amazon…and that kit recommends going through 5 different grits! Well, I don't think I'd use them for drinking glasses…however they are safe to handle and what darling candles they make! Thanks for the idea….now I have another craft….. Try pouring the hot and cold water directly over the crack Alicia. Hope you have better luck!